Ben’s research focuses on how people contribute to organizational effectiveness, focusing on the human-resources related foundations of competitive advantage, leadership, and high-reliability organizing. In particular, his interests include how managers, teams, and organizations succeed in adverse and ambiguous business environments. These contexts include dangerous work and those requiring strategic decision-making with limited information. He has several projects currently underway in these domains. Additionally, he has presented and is scheduled to present his research at national-level conferences (download Ben’s CV). Baran, B. E., Valcea, S., Porter, T. H., & Gallagher, V. C. 2018. Survival, expectations, and employment: An inquiry of refugees and immigrants to the United States. 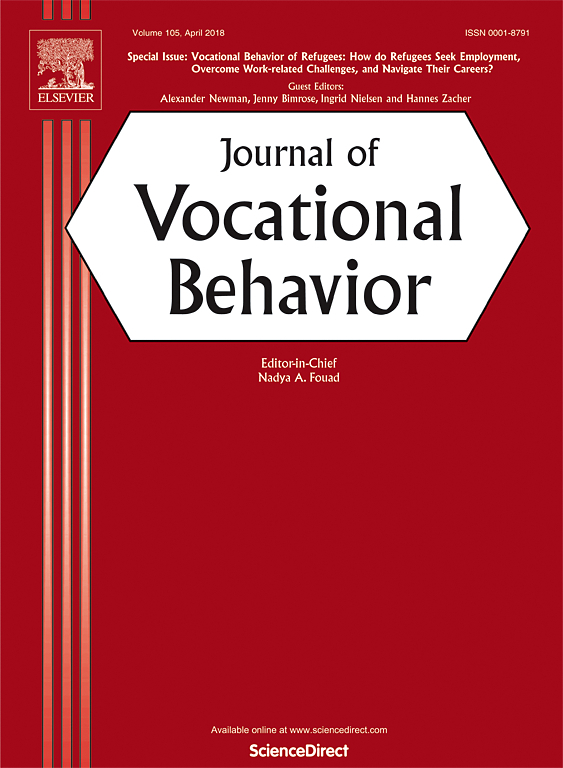 Journal of Vocational Behavior, 105: 102-115. Baran, B. E., Rogelberg, S. G., & Clausen, T. 2016. Routinized killing of animals: Going beyond dirty work and prestige to understand the well-being of slaughterhouse workers. Organization, 23: 351-369. Allen, J.A., Crowe, J., Baran, B. E., & Scott, C. W. 2016. Organizational identification: A context-specific mitigating resource of work-family conflict. Journal of Contingencies and Crisis Management, 24: 27-35. Baran, B. E. 2016. High-reliability HR: Preparing the enterprise for catastrophes. People + Strategy, 39(1): 34-38. Shanock, L. R., Allen, J. A., Dunn, A. M., Baran, B. E., Scott, C. W., & Rogelberg, S. G. 2013. Less acting, more doing: How surface acting relates to perceived meeting effectiveness and other employee outcomes. Journal of Occupational and Organizational Psychology, 86: 457-476. Rogelberg, S. G., Justice, L., Braddy, P. W., Paustian-Underdahl, S., Heggestad, E., Shanock., L., Baran, B. E., Beck, T., Long, S., Andrew, A., Altman, D. G., & Fleenor, J. W. 2013. The executive mind: An examination of top leaders’ self-talk, effectiveness, and job strain. Journal of Managerial Psychology, 28: 183-201. Scott, C. W., Allen, J. A., Bonilla, D. L., Baran, B. E., & Murphy, D. 2013. Ambiguity and freedom of dissent in post-incident discussion. Journal of Business Communication,50: 383-402. Baran, B. E., Shanock, L. R., & Miller, L. 2012. Advancing organizational support theory into the twenty-first century world of work. Journal of Business and Psychology, 27: 123-147. Baran, B. E., Shanock, L. R., Rogelberg, S. G., & Scott, C. W. 2012. Leading group meetings: Supervisors’ actions, employee behaviors, and upward perceptions. Small Group Research, 43: 330-352. Baran, B. E., Rogelberg, S. G., Lopina, E. C., Allen, J. A., Spitzmüller, C., & Bergman, M. E. 2012. Shouldering a silent burden: The toll of dirty tasks. Human Relations, 65: 597-626. Shanock, L. R., Baran, B. E., Gentry, W. A., Pattison, S. C., & Heggestad, E. D. 2010. Polynomial regression and response surface analysis: A powerful approach for examining moderation and overcoming limitations of difference scores. Journal of Business and Psychology, 25: 543-554. Baran, B. E., & Adelman, M. 2010. Preparing for the unthinkable: Leadership development for organizational crises. Industrial and Organizational Psychology: Perspectives on Science and Practice, 3: 45-47. Baran, B. E., & Scott, C. W. 2010. Organizing ambiguity: A grounded theory of leadership and sensemaking within dangerous contexts. Military Psychology, 22 (Suppl. 1): S42-S69. Allen, J. A., Baran, B. E., & Scott, C. W. 2010. After-action reviews: A venue for the promotion of safety climate. Accident Analysis and Prevention, 42: 750-757. Baran, B. E., Allen, J. A., Rogelberg, S. G., Spitzmüller, C., DiGiacomo, N. A., Webb, J. B., et al. 2009. Euthanasia-related strain and coping strategies in animal shelter employees. Journal of the American Veterinary Medical Association, 235: 83-88. Baran, B. E. 2017. Armed conflicts: Implications for organizations. In Rogelberg, S. G. (Ed. ), The SAGE Encyclopedia of Industrial and Organizational Psychology (2nd Ed.). Thousand Oaks, CA: Sage Publishing. Baran, B. E. 2017. Learning agility. In Rogelberg, S. G. (Ed. ), The SAGE Encyclopedia of Industrial and Organizational Psychology (2nd Ed.). Thousand Oaks, CA: Sage Publishing. Baran, B. E. 2017. Psychological resilience. In Rogelberg, S. G. (Ed. ), The SAGE Encyclopedia of Industrial and Organizational Psychology (2nd Ed.). Thousand Oaks, CA: Sage Publishing. Baran, B. E., Scott, C. W., & Bonilla, D. L. 2013. When mistakes almost become disasters. In G. B. Graen & J. A. Graen (Eds. ), Management of team leadership in extreme context: Defending our homeland, protecting our first-responders: 85-101. Charlotte, NC: Information Age Publishing Inc.